I have a 4 ft. wide x 13 in. deep bulkhead running the entire length of my condo living/dining area, about 35 ft.! 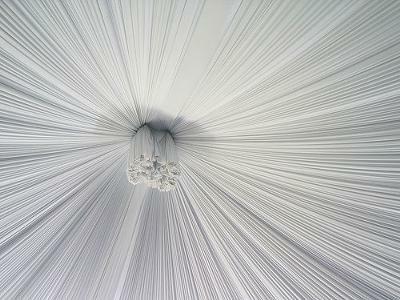 It is stippled white like the rest of the ceiling. What can I do to minimize its oppressive bowling alley effect other than removing it? Hi Eli - I think you have several options. 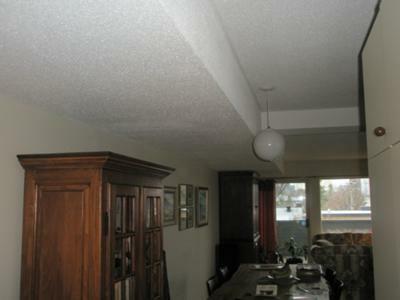 Firstly, you could cover the ceiling with fabric. Perhaps not as fancy as the picture above but I'm sure you get the idea. A simple baton attached to the wall that you can staple the fabric to is probably the easiest way. You may not be able to totally obscure the bulkhead this way but it will certainly minimise it. Another option would be to lessen its effect by adding a board to the bottom of the bulkhead to some point further across the ceiling - the furthest point if possible - to create a sloped effect. My only concern is that it may make you feel a bit tipsy living with a sloping ceiling! Another way to lessen the effect would be to paint your ceiling with stripes. It doesn't need to be anything too dark - even two quite neutral shades, with the lines going along the length of the bulkhead, would make a difference. Finally - the option that would probably look the best but would be the most difficult to do - install a drop ceiling. This will only work well if it is a fairly high ceilinged room to begin with or the ceiling may feel uncomfortably low. white foam version of this. If you are willing to sacrifice some square footage, you could frame it out and create a walk in storage wall, resulting in a flush, even ceiling and wall. Join in and write your own page! It's easy to do. How? Simply click here to return to Do You Have A Question?.